For the last two weeks I’ve had the flu! What fun. Actually, it was kinda. Last year when we got the flu after our Christmas trip, I read a Vince Flynn book that I’d had on my shelf for ages: Transfer of Power. I enjoyed it a great deal. I’d read his first novel, Term Limits, years ago and thought it was really lame and juvenile, so I never tried another. But he went on to become a very popular, best-selling author, so I decided, in the hopes that he had improved his skills over time, I would try his second book, mentioned above. Surprise! I liked it. Of course I did have the flu, and it was a welcome diversion from the wretchedness of being ill, but really, I thought it was pretty good. 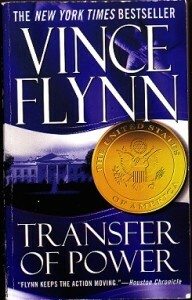 Transfer of Power is the first one where his series hero, Mitch Rapp is the main character, and it is about terrorists taking control of the White House, killing dozens and taking hundreds hostage. Rapp, the CIA’s “top counterterrorism operative” is sent in to take care of the problem. 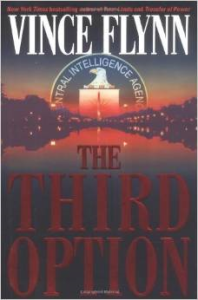 With this most recent bout of the flu, I turned to Flynn again, seeing as I had found at the used bookstore the next two of his novels in the series: The Third Option and Separation of Power. The verdict? I enjoyed both books, though I struggled at bit with The Third Option at the beginning because I kept getting lost. Finally about a quarter of the way through, when I realized I had no idea what was going on, I wondered if I was no longer capable of reading books as complex as these with my aging brain… Or was the problem really Flynn simply not being clear? After all, the characters in The Third Option had been presented as if I should know who they were, but I couldn’t remember any of them and there were no reminders for those who might be in my position. Finally I went back and dug up my old reviews of Term Limits, his first book, and made my first discovery — the characters I was puzzling over In Transfer of Power were indeed the main characters in Term Limits. A book I’d read 11 years ago! No wonder I couldn’t remember them nor the operations they’d taken part in! And what was the result of my investigation of technique? The writing was, indeed, unclear. For one thing, Flynn writes from the omniscient point of view, which means he jumps into any characters’ viewpoint whenever he wishes all within the same scene. The problem with this type of point of view (pov) is that if you’re not careful you can lose your reader along the way, and that’s exactly what happened. You have to be very clear you’re making a pov jump and to whose point of view you are jumping, which Flynn didn’t always do. The problem is that this second paragraph is all from the Hoffman’s pov and includes information Rapp does not have. But there’s nothing in the text to give you even a hint of that. In fact, in paragraph one they’re told by their contact that someone will be joining them and in paragraph two that this “professor” has joined them… so… it seemed logical to put those two together, all of it stuff that Rapp knows about. Except that he doesn’t, as I said, the viewpoint having shifted out of Rapp’s specific awareness at the end of paragraph one and into a general omniscient. And since that’s not remotely clear, the result is confusion on the reader’s part. At least on this reader’s part. This entry was posted in Book Thoughts, Uncategorized, Writing and tagged Book review, Books, writing techniques on March 22, 2015 by Karen Hancock. Well, finally, after all the catch-up I played last week after our trip, I’ve gotten back to work. It was a productive day! When I started, though, as I looked at the three hundred or so 2″ x 3″ cards scattering my desk, I felt quite overwhelmed. 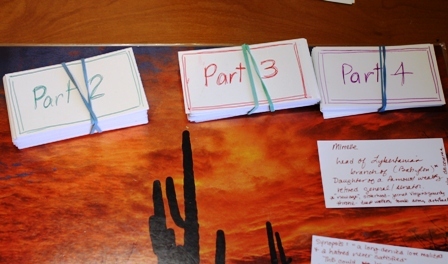 Over time I’d used them to note down ideas as they had occurred to me — ideas about character, about incidents or events that might happen, about a character’s intentions or desires or reactions… each to its own card, but the cards all in a jumble. All waiting to be put into some kind of coherent plotline. Augh! How was I going to do this? It was all swirling around — random events and occurences that seemed to have no relation to one another. I needed, so I thought, to form some kind of plot line, but I felt lost in a fog of indecision. So I went to the Lord, which I’m doing a lot more now than I have in the past — about almost everything. And began to go through them one by one… placing some of them on the “beginning” placemat, some on the “ending” space and just parceling out the rest of them as seemed fit, more or less where I thought they would fit in the story. 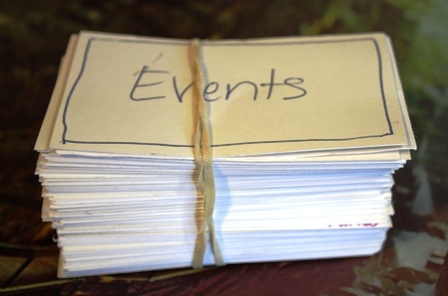 Some events were predicated on others, some had to come after others… Sometimes I had two cards with different options for the same event, mutually exclusive. Sometimes I had two cards with slightly different takes on the event, or different details or trappings for it. I just laid them all down, some in rows, some on top of other cards, some bridging two rows. Some of them I even put between the placemats when I wasn’t sure. It was kinda fun, because I didn’t have to decide, just generally divide up the cards. Some of them I even threw away. And it was something of a comfort to find that for several of the events I’d envisioned, I’d made two, three even four cards with the same event on it. Once I had them all parcelled out, I divided them into four piles, which I gathered together in a rough approximation of the order they’d been placed on the table. The operative word here is “rough.” I was not demanding that I be precise and orderly, it was just to be a general dividing of the concepts. Above you can see parts 2 -4 all gathered up and secured with rubber bands. And having done that I have the beginnings of a line of events to work with. Nothing finished by any means but a start. There are lots of holes, and some of them are just ideas that need fleshing out. Some — those either/or cards — require a decision to be made one way or the other. But that’s all tomorrow’s work. Oh, and I’m still loving my Freedom program, which I blogged about awhile back. That and turning off the phones, continues to give me what feels like a safehaven in which to relax and focus on the work… Plus something about the suspension of being available for contact motivates me to use the time to advantage rather than simply dink around. This entry was posted in My books, Novel development, The Other Side of the Sky, Writing, Writing Tips and tagged Distraction Proofing, novel development, Writing, writing techniques, writing tips on June 4, 2013 by Karen Hancock. Today I actually managed to get around to working on Sky for a good five hours!Actual story writing as opposed to note organizing. A tiny bit of progress. YAY! I did so using a new technique that I’ve recently discovered and an old one I’d forgotten. The new technique, developed to help increase productivity, is called The Pomodoro Technique, so named because its inventor used a red tomato kitchen timer to implement his system. He’s Italian and “pomodoro” is Italian for tomato. The technique was designed to also investigate where various distractions originated and to provide a means of dealing with them. I used it pretty much as outlined (click on the link above for the full thing) when I started a couple of weeks ago. There is a free booklet you can download and some official pages as well: a To Do Today sheet and an Activity Sheet. You list the things you want to do on the first sheet. In the beginning, I listed things like “write a blog post,” “read through all my notes on Sky,” “transfer information on sheets to little cards,” etc. Then you set the timer for 25 minutes (a “pomodoro”) and get started. If you suddenly get a thought to go do something else, you are to make a tic mark in the column next to where you listed your task, then decide if the activity must be done right now, or if it can be done later. If later, you note it on the Activity Sheet. If you feel it’s imminent — you absolutely HAVE to order that pizza now — you note it at the bottom of the To Do sheet. One of the iron clad rules is that you cannot spend more than a minute or two on some distraction so if you do get up and order the pizza, then you have to void the pomodoro and start over, even if you’ve only got five minutes left. It was in intriguing exercise which made me aware of all the things I kept thinking of doing in the middle of when I was supposed to be writing. Internal distractions the developer called them. They seemed to come rapid fire at first. But because I had the timer on, I stopped getting up to go do them and just noted them on my activity sheet. The more I used this technique, the less internal distractions I had. Plus having a place to note them helped a lot. 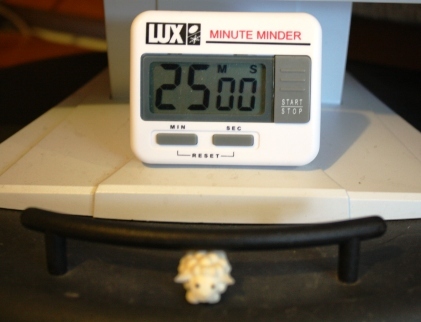 After the timer goes off, you place an X in the column next to your task, then take a 3 to 5 minute break to walk about, stretch, visit the restroom, or get a drink. Then it’s back to another pomodoro. . After four pomodoros you get a longer break of 15 to 30 minutes. It’s not as complicated as it might sound, but it’s pretty regimented and while at first it did a lot to get me back on track, ultimately I rebelled and one day I just couldn’t make myself do any of it and went out to play. I’ve since abandoned the activity sheet, since it’s not all that relevant for me. Before, if I hit a snag there was a good chance I’d just get up and walk out of the room on some inner directed tangent. With the pomodoro, I at least wait until the timer rings before walking off, though even then I haven’t wanted to dive into some other thing. So that’s the new — modified — technique I used today. Yes, I know… rules again. But not exactly. I think they’re more just useful guidelines that keep me on track. So for now I’ll keep using them. I have my own “pomodoro” all set up under my computer screen. The other technique, the one I’d forgotten, was to use a coin to build my characters. I had five male characters who were nothing but names that I needed to be in the scene I am currently working on. So one of the things you can do and which I had actually made charts for years ago, is to divide characteristics into twos… tall/short, fat/skinny, muscular/frail … then flip a coin to determine the characteristic — eg, heads, he’s tall, tails he’s short. If you have more characteristics than two, like hair or eye color, use a die — assign a color to each number, then roll the die. It’s a way of breaking through the blankness. As the characters started to emerge, I found myself thinking, “Wait, I don’t want him to have light brown hair, it should be black instead.” Or, “No, he’s not going to have a beard, he’s going to be clean-shaven.” You aren’t bound to whatever the die or coin dictate, but if you don’t care, it’s a way of actually getting something to take shape. So that’s what I did today using my pomodoros, and my coin and die. I now have five index cards and five characters with a fair amount of definition. Since these are minor characters, I’m not yet sure how big of a role they’ll play so I don’t want to go too far in developing their profiles. For now, I have enough to work with. Another thing I did, that came out of nowhere, was that as these guys were coming together I started seeing parallels to some of the Avengers, so I decided to just go in that direction and use the Avenger characters as a rough guide for my development. Oh! Horrors! She’s copying movie characters! Not exactly. I think it was more a general template and lifting one or two characteristics from each. And it was fun. I know in the end it won’t be noticeable, because once they get “real” for me, they’ll take on their own individuality. Besides, they may turn out to have almost no role at all. I have no idea at this point. All I know is, it helped me work, and as a result I ended up with one guy who’s a techie and another with anger issues. As an additional bonus, those two qualities triggered thoughts about the setting and the situation and suddenly the whole scene — characters, interactions, setting, situation and action — gained richness and substance and direction far beyond what I had when I started. 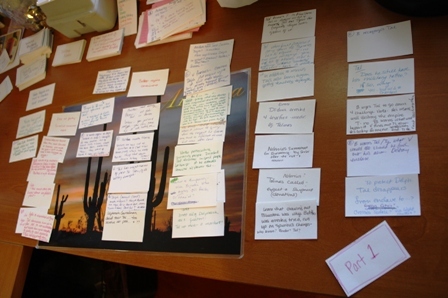 This entry was posted in Novel development, The Other Side of the Sky, writing life and tagged character development, novel writing process, pomodoro technique, time management, Writing, writing techniques on July 11, 2012 by Karen Hancock.